EZdrummer 2 combined with two massive EZX sound libraries, tailor-made for metal. Meet your new metal drummer! This bundle combines the world’s most intuitive drum production tool with two (2) additional EZX sound libraries specifically designed for metal drum production. 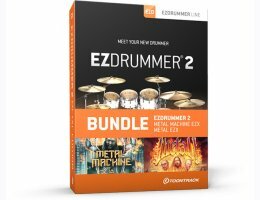 Aside from the five (5) meticulously sampled kits and the comprehensive functionality in EZdrummer 2, you get an additional twelve (12) drum sets, engineered and produced by some of the top names in today’s scene: Andy Sneap (Testament, Megadeth), Mark Lewis (Whitechapel, DevilDriver), Jason Suecof (Trivium, The Black Dahlia Murder) and Daniel Bergstrand (Meshuggah, In Flames). Add to this the large collection of mix-ready presets and massive libraries of world-class drum grooves and you have all the tools you need to start forging your metal tracks – today.